Sometimes do you find that the prep work takes longer than the actual project? I have been cutting these fabric scraps (and true to form, there are more scraps left than when I started...are they like worms, you cut them in half and they multipy)? I don't get it??? Good thing it is not chocolate!! sent these fabulous patterns and calendar. Trying to convince me to join her personal quilt quilt along....(she is very convincing......), this is a quilt that represents you personally...go to her blog and check out the details if you are interested! She sent me more inspiration when my mojo is gone....Thanks Betsy....you made my week! This is the book I picked out! Today I was making a mad dash to finish up a few things and clean house at the same time. So, I finished quilting this top, needs binding....that is for another day. Handed out chores to the two sons that are here and just got down and dirty..... I even made homemade rolls today.....(not making it easy on myself to lose weight.....but that is for another day as well). Don't forget Thimbleberries day Wednesday......let me know if you plan to join us. 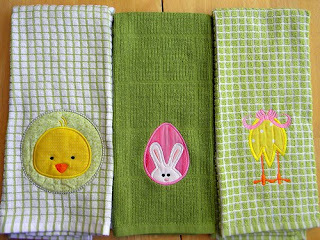 I won two of these fun Easter towels from "As the Quilt Turns", aren't they adorable??? Actually, everyone that entered her giveaway won two...isn't that fun? Thanks so much Becky!! Yesterday we went to the Museum of Natural History and Aviation. We took the Metro and got the whole Washington D.C experience. Later that evening I wanted to try the Honey Bun Log Cabin. I swore I would never do a log cabin but...what was that Kelly...."Never say Never"
You can find the video for this Honey Bun Log Cabin here. They also have the deal of the day and their honey bun is going for 4.95.....that is a bargain in itself. I made five blocks from the "Swanky" honey bun. I love these colors, so Fits the Easter Holiday. I just used two fabrics (wish I had more of the green). I also figured out how to put the block between the rows.... Trust me, it looks far better in person. Here is what the fabric looks like up close and personal. I took several pictures of this top and still could not get it to look like this. There is not bubble in the quilt, it does lay flat...in hurry.... Oh...these are 8" blocks instead of the 10" in the picture below. Headed out the door or I would do better. Made this last night before I went to bed...(nope...didn't stay up all night). This took me again, 3 hours to make.....if I hadn't put the blocks in the middle of the rows it wouldn't have taken as long. I needed a quilt fast and my sister at Inchworm Fabrics showed me this 10 minute block a while back. (click on 10 minute block for video)...only three seams! So today I decided to give it a try..... How fun is this? It took me less than 3 hours to make this quilt top. My son wanted me to play more with the design, I should have let him do it and I just sew it but I was in a hurry. This design has so many possibilites, my mind was just reeling with different ways but for now, this will do. I am not putting a border on it, maybe just use purple or yellow to bind it. That is all of the fabric I have left. It looks alot more fun in person. I think some little gal will love it. I did Cathedral windows with the block in the middle. Plastic grocery bags!!! I have them, they are cheap. Get the ole trusty rotary cutter (you have dull blades somewhere)...and start stripping.....nothing like a little stripping to get the day going good! Doesn't my little bunny look all snug in his basket? I was also thinking that this would be great for filler paper for gift bags as well. EASTER BASKETS AND ORANGE SLICE SCRAP WINNER! Think my sons will love these Easter Baskets......HA!!!! I think they would send me out of town on a rail if I were to give these to them....it would be funny tho...don't you think? The bottoms looks funny but trust me, they are just fine, I should have staged them better...looks like they have a hitch in their get along! I found the pattern at Mistea Crafts, it is called a Goody Bag. Her's is so much better than mine, it has stitchery but I didn't have time to do it....go to here to find the actual pattern. The winner of the orange slice scraps is Swooze's Quilts and Tall Tales. If you harbor any ill will, direct it towards the third son, he picked the number! MR BIG GUY IS BACK!!!!!! Well.....He is home....and I am sooooooooooo thrilled. It did not cost me one penny. I was shocked! I was geared up to pay through the nose because just for them to work on a machine is 100 dollars. When she said there was no charge, I just couldn't believe it. 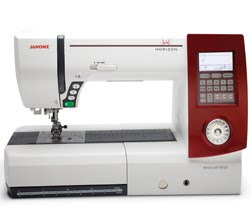 After talking to the JANOME on the phone and emailing customer service, I was sure I was going to have to pay. I didn't even have to pay for the throat plate. I was told by both on the phone and by email that the throat plate was not under warranty. Now I am afraid to use it. She did mention something about the thread is not suppose to come through the needle plate (what no tail)....and said that I should use the automatic cutter each time but not with the foot up (that was if I forgot and then remember while the foot was up and went to use it). So to all of you who want one and was scared off....I would say it is the ignorance of the operator.....broken needle and all. I found out that she also gives classes.....I certainly am going to take them.... I also found out that with this machine you do need the classes. Maybe if I had had a class or two this would not have happened. although, it was a needle breaking that did it. I just want to say that "A Stitch In Time" here in Fredricksburg, VA is awesome!!! So what am I doing while the boys are home? I am filling their orders for their favorite foods (for some reason Mr. Burger King lives here and they have to have it their way)..... this is all of my son's favorite and thier biggest request. Picture is a little yellow but my third son loves these. Yes...all by scratch. My husband says I spoil them....I won't tell you what he has been doing.....nope...I won't dime him out but he is just as bad, if not worse. Tomorrow it will be lasagna. So not much is getting done besides cooking and doing the dishes.... I am working on the second "Be Attitudes" blocks while the men are watching James Bond....It is not like they haven't seen this one 100 times. I am sure they can recite most of the dialogue. Maybe they just want to be James Bond, what man wouldn't, women flocking all over them, money, cars, guns.....yep....I can see it. Maybe I want to be Wonder Woman, with that waiste line and long legs...what woman wouldn't? A fourth son comes in tomorrow! Here is my Orange Slice flimsy...... I didn't have enough orange fabric to go all the way across the top so I did white with butterflies in the corners...one is not going in the right directions (will have to fix)..... I also added another row on the bottom.....don't ya just looooovvvvveeee it??? My son James is up and so I asked him to pick a number and he said 27 that is Judy from Sew Meow..... Thanks to all of you who came by and entered.....Have a great week-end. I JUST DON'T FEEL LIKE IT! When I think of her blog name, I think of someone laughing so hard that their side hurts....such a fun name and fun blog. I have not to this date used aurifil threads and now so excited to get the opportunity to use it. She sent these wonderful cut outs....oh my gosh...my mind was reeling with ideas of what to do with them all... My mind is still going at it....so soon, very soon....there will be a fun quilt being born. I believe all the asphalt is gone (blushing)......and the black and white material is just awesome!! Thanks so much Joanne!! This certainly was a fun hop, I hope you all were able to join us. Sew Cal Gal sure put alot of work into this and so I wanted to take a minute to thank her for her hard work. Picking up another son today....and husband who has been out of town for a week....busy day...no sewing today either! April 14th....hope you hop over there and join the fun!! Also, I have a giveaway going til tomorrow, it was a long post yesterday and the giveaway was a reward to those that endured the long post and to share the wonerful find I found. So...my son David and I were headed out to pick up the 4th son this evening in Richmond, he came from Hawaii......(whohooooo....now this young man has an infectious laugh and it is so fun to hear his laugh fill the house....how I have missed him). Anyways, I check the mail before I left and to my utter surprise and delight (I think I actually squealed)....good thing my son was driving, I was sent 4 cards of buttons from ButtonMad!! I did get a strange look from him as I was jumping up and down in my seat (not good for the suspension).... Check out their blog!!! I can't get enough of their buttons!!! What a creative group of women.... Women Empowering Women!!! Thanks soooooo much!!! Then I received this a few days ago from "The Second Twin"
She wanted to know what 47 felt like.....let me see if I can remember while I walked 20 miles in the snow to school, all up hill...HA!!! She has a wonderful blog.... Thanks so much!! ....okay...a person can only take so much but it just didn't stop there. So...I am going to the grocery store but by the store is a Tuesday Morning .....I love this store and well....I decided to stop in and have a browse before going next door for food. Low and behold....look what I found and for cheap...12 fat quarters for 4.99....oh...yes 4.99!! Two yards of fabric for 2.50 each..... I think I hit the mother load....but wait...there is more!!! Then I found these Pre Printed Paper Piecing for Crazy patches (8 printed pieces for 48 - 6" finished blocks, or 9 printed pieces for 54 - 8" finished blocks or 6 printed pieces for 36- 10" finished blocks. Why am I going to such pains to tell you about these packets? Because I am going to offer one to a lucky winner. Just leave a comment and tell me which one you would like! Why not share the finds? Oh...I will pick a winner on Friday....I have another son coming in then! Thanks for coming by and visiting me yesterday.....I hope you continue to visit the other blogs in this hop. There are so many talented people out there, it just floors me. 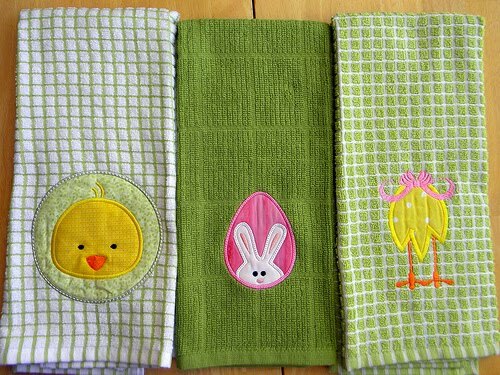 Thanks for joining the Accuquilt Go Cutter Spring Hop. so....when I did the applecore vase, I contacted several people to make sure no one else thought of it. If they have and you know about it, let me know, but as far as I know, this is my original idea. As you can see, it is just two applie cores, one on top of the other. I cut off the top and put it in the bottom arc. You can just cut off the top and cut across the arc and make it straight it you want Either way is just fine. I did not notice until now that my vase is a little crooked. Pooey!! While cutting these, I did not use steam a seam, I am so stingy that I didn't want to waste any on mistakes or just trying to design.....so....I had to glue the pieces on. I have seen some people do this and I must say that I don't like this way of applique, to me it is not a neat (as in presentation) and sometimes is hard to applique. That is just my opinion. Forgive the imperfections. I think if I were to do this again, I would not try to mitre the corners in the middle square. That caused alot of problems. The schedule for the rest of the week is on the sidebar.